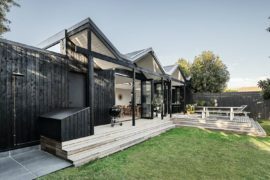 That roof over your head can offer much more than mere cover or shade. 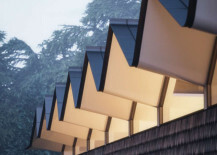 With a myriad of contemporary designs, roofs are organic, sculptural, pitched, flat and curved. 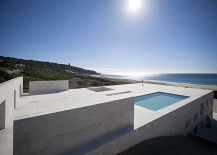 They are walkways, viewing platforms, places to relax, to swim and garden. And increasingly, the roof can provide a building’s energy needs. 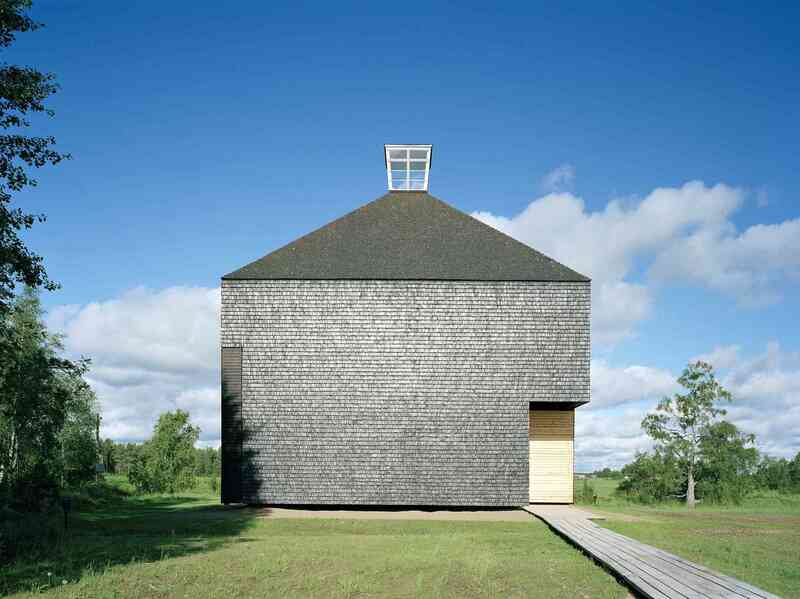 These fifteen contemporary roofs showcase the array of designs utilized by architects in order to raise the roof. 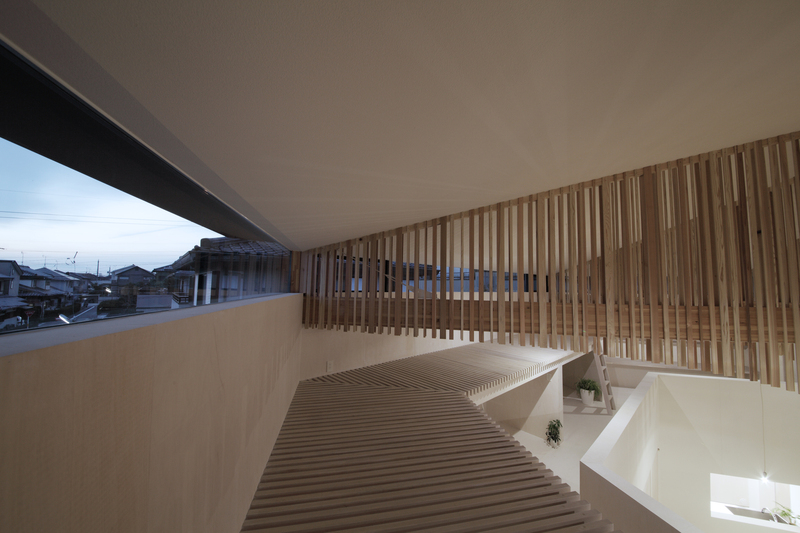 The much applauded and somewhat enigmatic Giant’s Causeway Visitor Centre was designed by Dublin-based Heneghan Peng Architects. 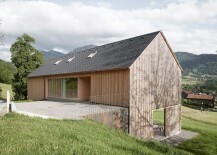 The centre’s sloping grass roof cleverly affords sweeping views of Ireland’s craggy north Antrim coastline. 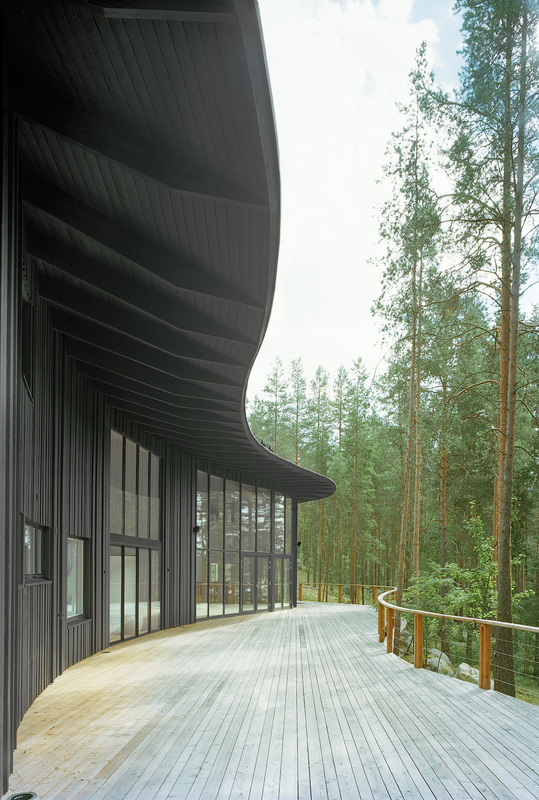 Blending with the surrounding topography, the roof allows visitors to walk over the building and includes window panels that expose glimpses of the exhibition space below. 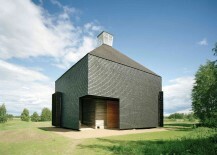 Photos © Hufton + Crow. 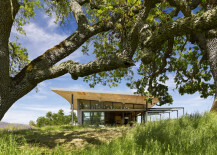 The ranch-style design of Caterpillar House emphasizes its relatedness to the rolling countryside. 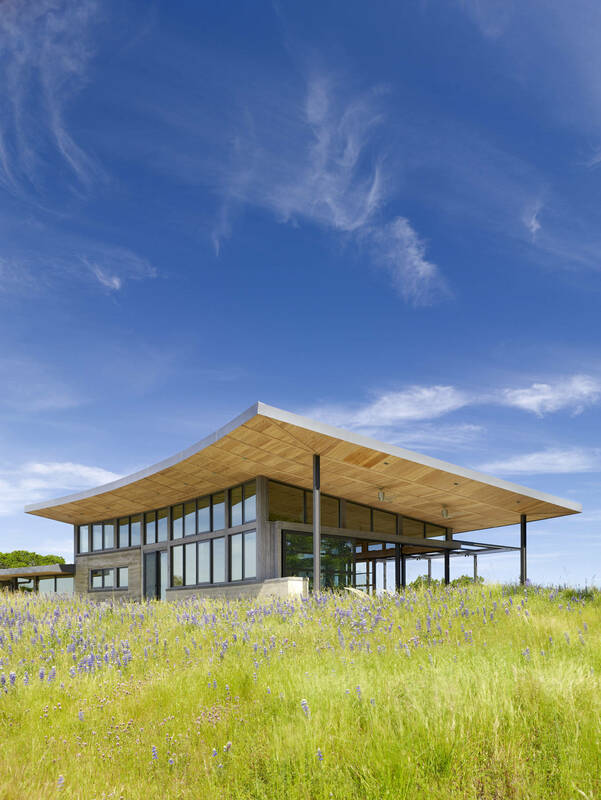 By incorporating integrated photovoltaic panels, award-winning residential design practice Feldman Architecture ensured the house was able to supply all of its own energy needs without any compromise to the elegant curve of its low roof. 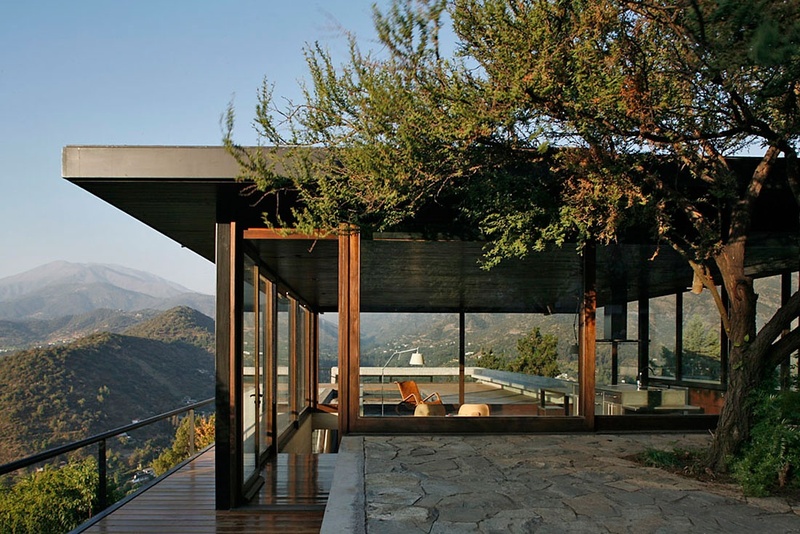 The roof also acts to provide shade from the hot California sun. 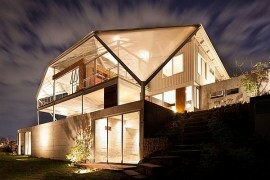 Photos © Joe Fletcher via ArchDaily. 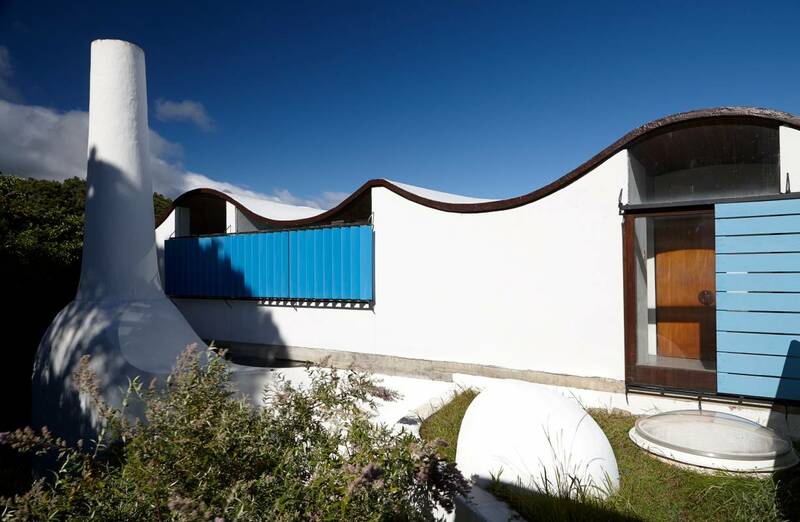 The horizontal plane of this modern roof structure acts to cover a beautiful, bright and spacious pavilion setting that overlooks the surrounding Andes mountain ranges and Santuario de la Naturaleza Valley. 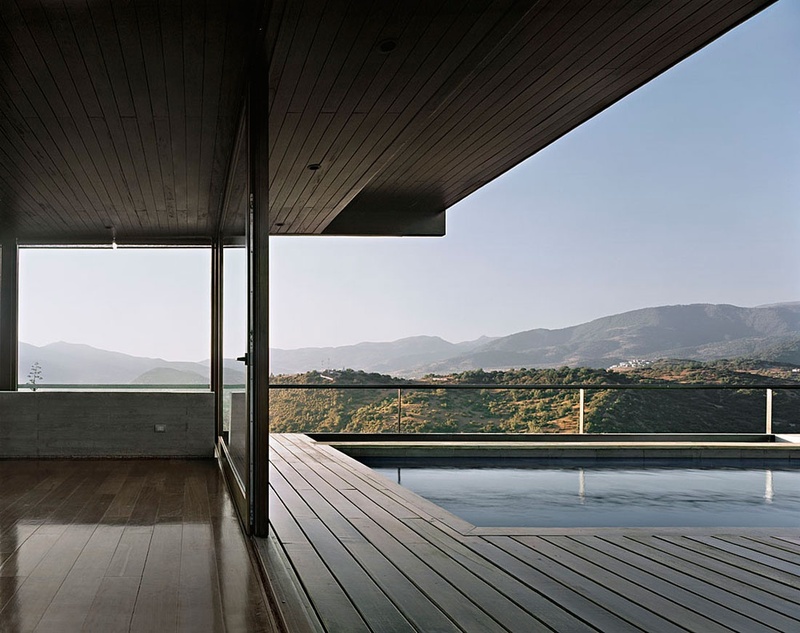 Set in Las Condes, Santiago in Chile, and designed by Max Núñez Arquitectos, the pavilion is a space for repose and respite, providing a reassuringly tranquil haven. 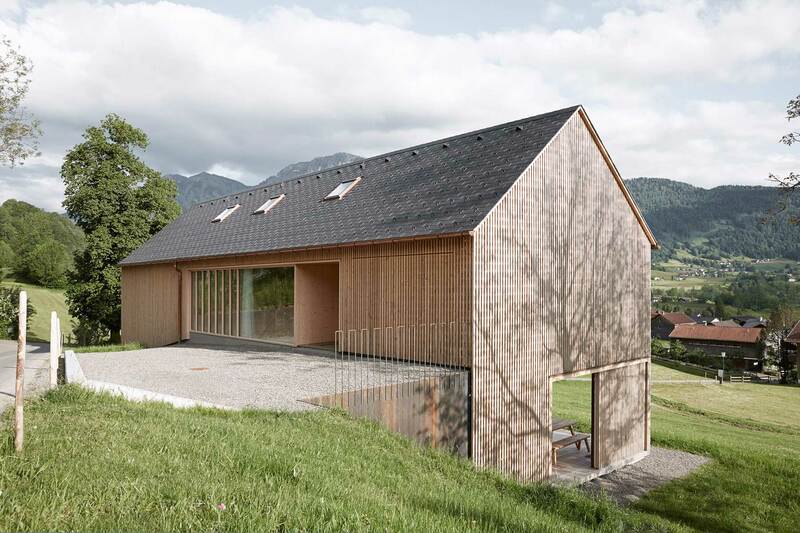 This two-story house by Architekten Innauer Matt, named after the clients as “Haus für Julia und Björn” (House for Julia and Björn), has a steep roof and structural elements that include roof cantilevers. 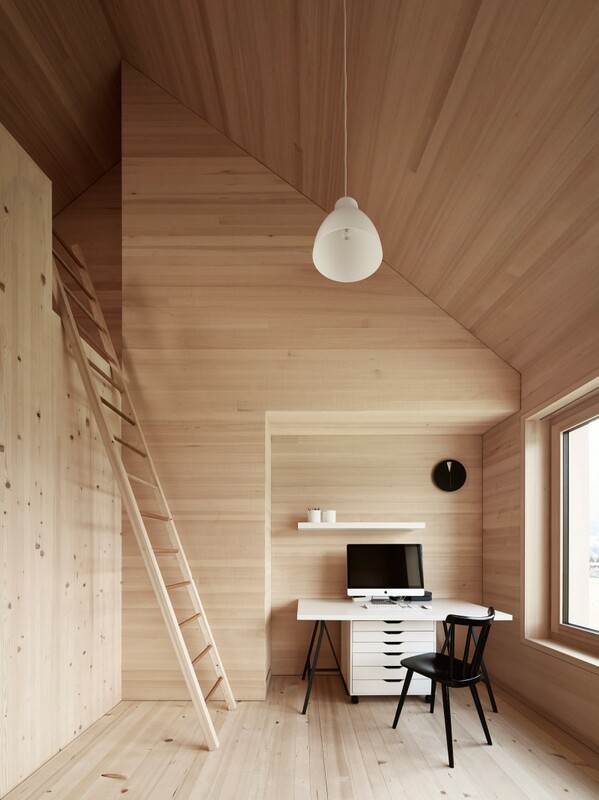 The roof’s pitch allowed for loft spaces to be added to the smaller bedrooms. 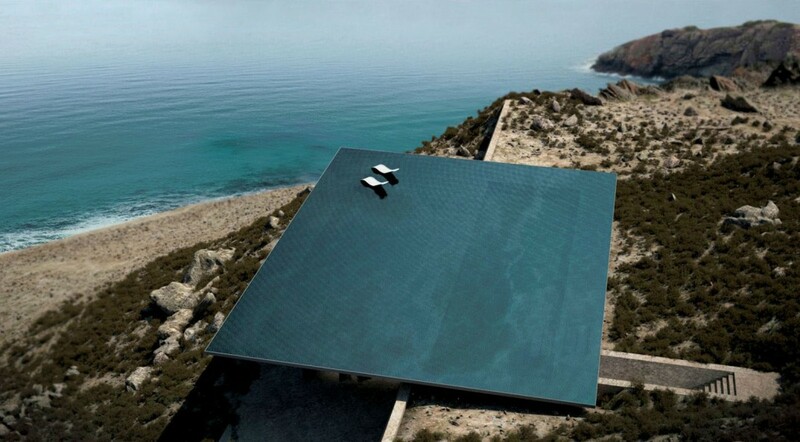 Located on the Greek island of Tinos and sited on a sharp sloping rocky plot that overlooks the Aegean Sea, ‘Mirage’ is a single-story structure (under construction) whose living space is covered by a rimless infinity pool rooftop. 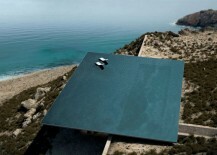 Designed by Kois Associated Architects, from a distance on higher ground the pool acts to produce a stunning visual impact, reflecting the surroundings and appearing at one with the sea. 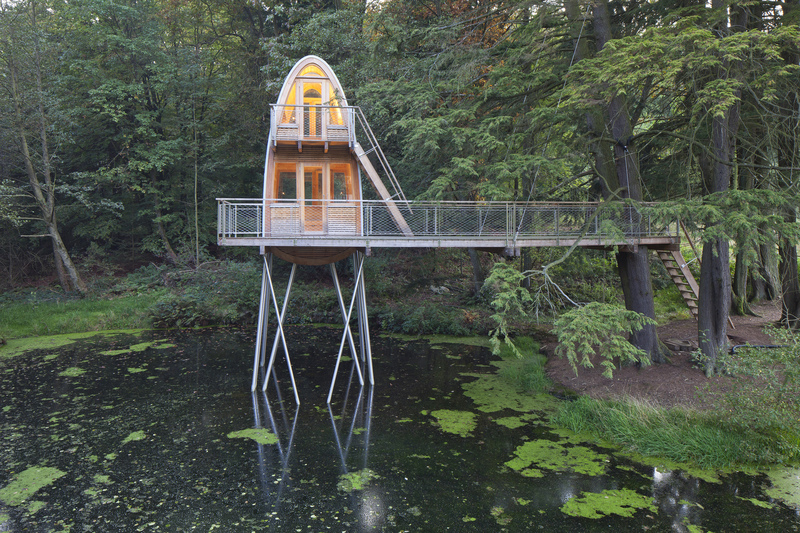 Treehouse Solling, a two-story tower by Baumraum, is located in Uslar, North Germany. 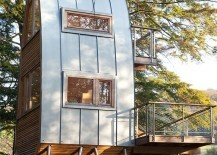 Its clever roof structure was formed using curving sheets of zinc and incorporates a skylight – perfect for stargazing. 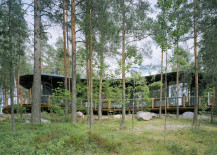 Designed by Finnish architecture studio Sanaksenaho Arkkitehdit Oy, the two-story Villa Musu portrays an almost organic form, naturally flowing and blending with the surrounding landscape. 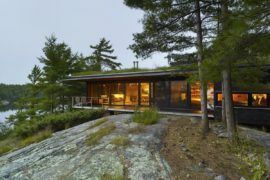 Its gently rounded roof has a bean-like configuration when viewed from above. Photos by by Jussi Tiainen via Thisispaper. 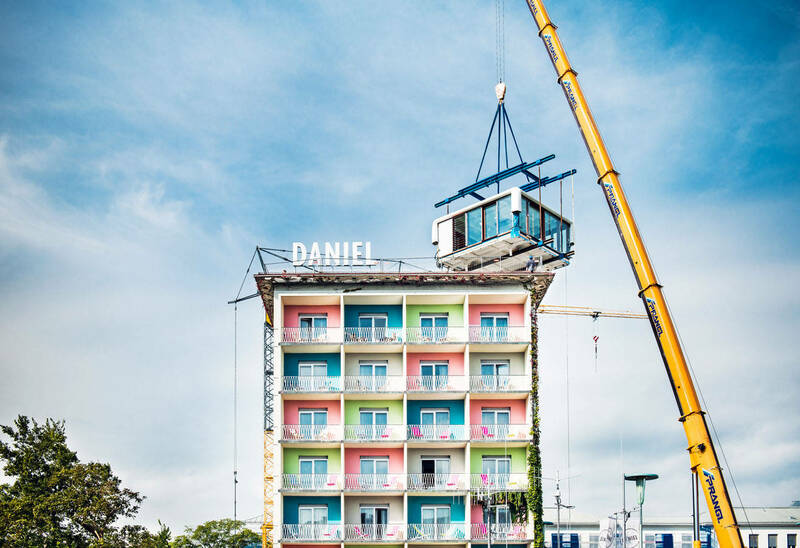 Less a contemporary roof per se but rather a contemporary roof installation, LoftCube was installed at the top of Hotel Daniel Graz in Austria. 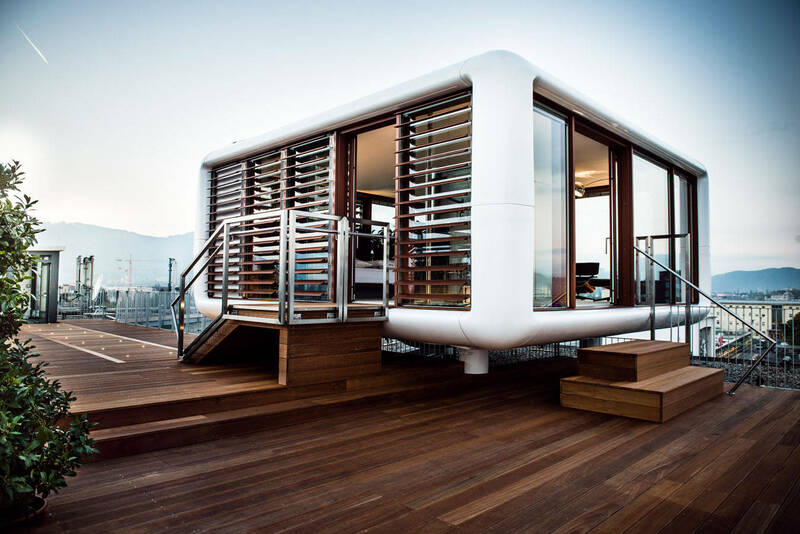 Billed as “the highest suite in town” and conceived by Berlin-based Studio Aisslinger, the LoftCube offers residents panoramic views of Graz and a well-appointed interior space. 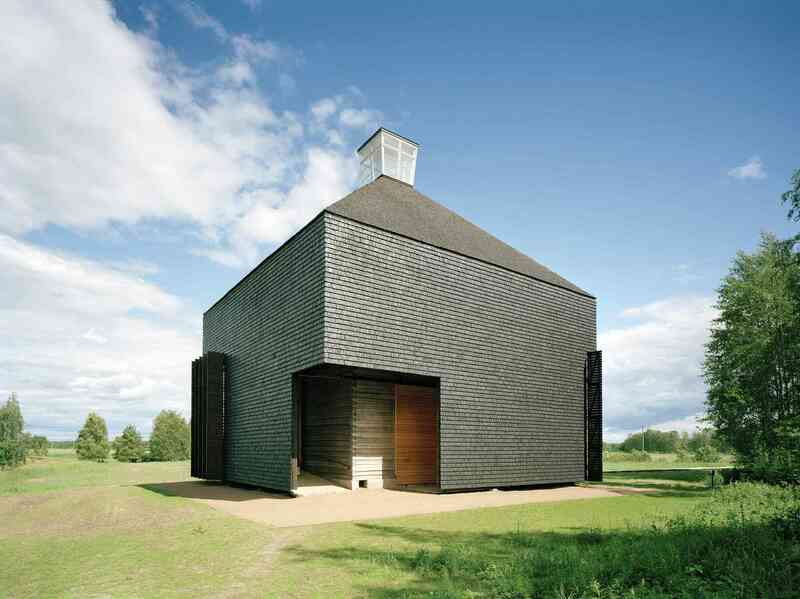 Designed by OOPEAA, this modern 21st century church in northern Finland has a log-built interior core and an exterior ‘cloak’ made with aspen shingles dipped in tar. 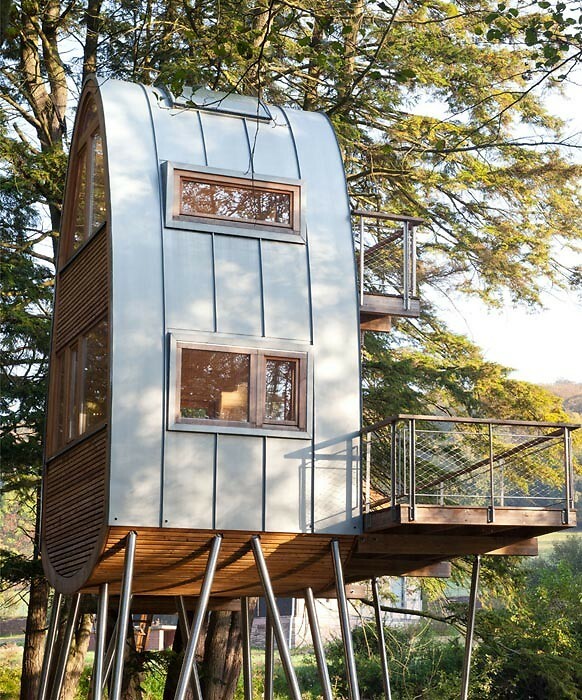 The structure was handmade using traditional building techniques. 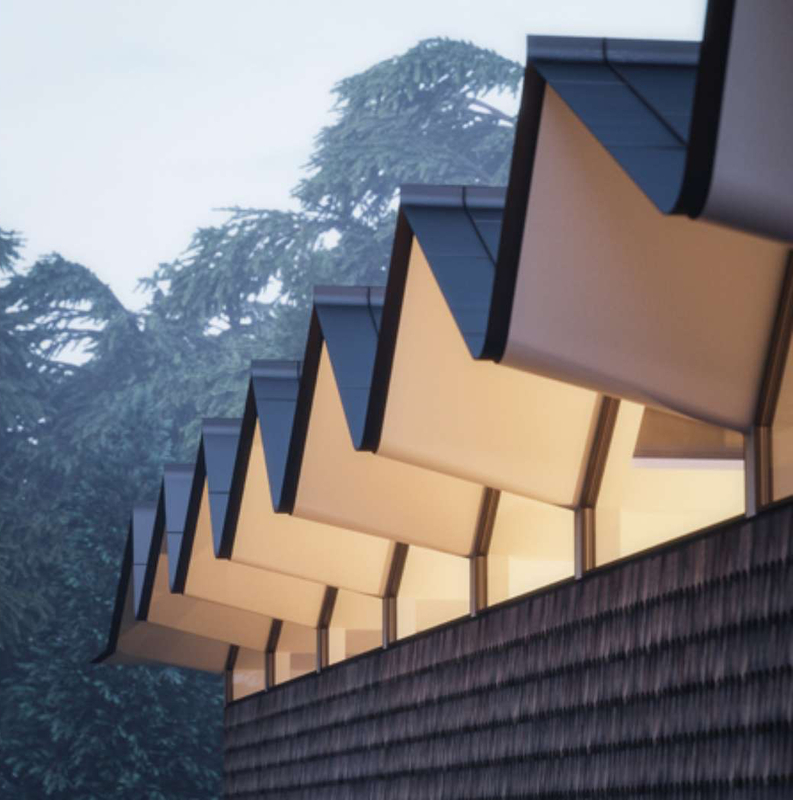 It has a simple box-like form and a gabled roof topped with a lantern skylight that filters natural light into the building. 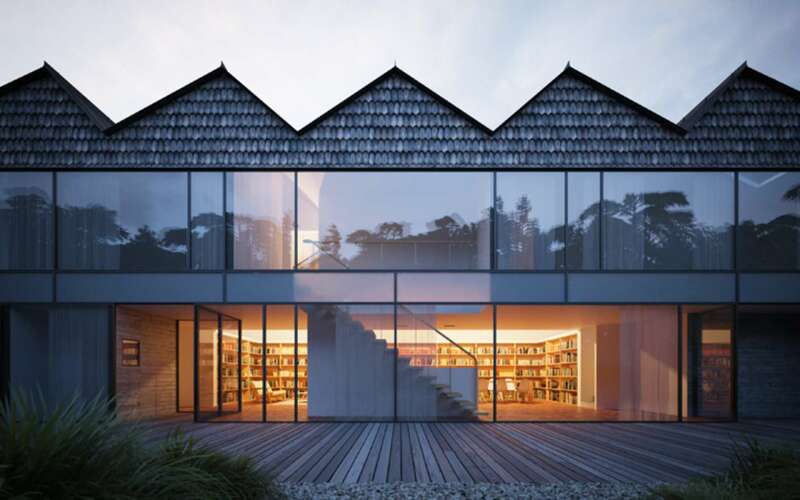 In designing this hexagonal home in Toyota, Japan, Katsutoshi Sasaki + Associates separated the roof from the exterior wall using clerestory windows. 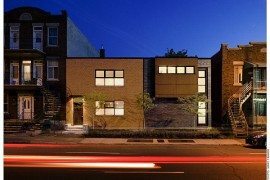 In doing so, the architects afforded the homeowner views of the sky from the entire circumference of the house. 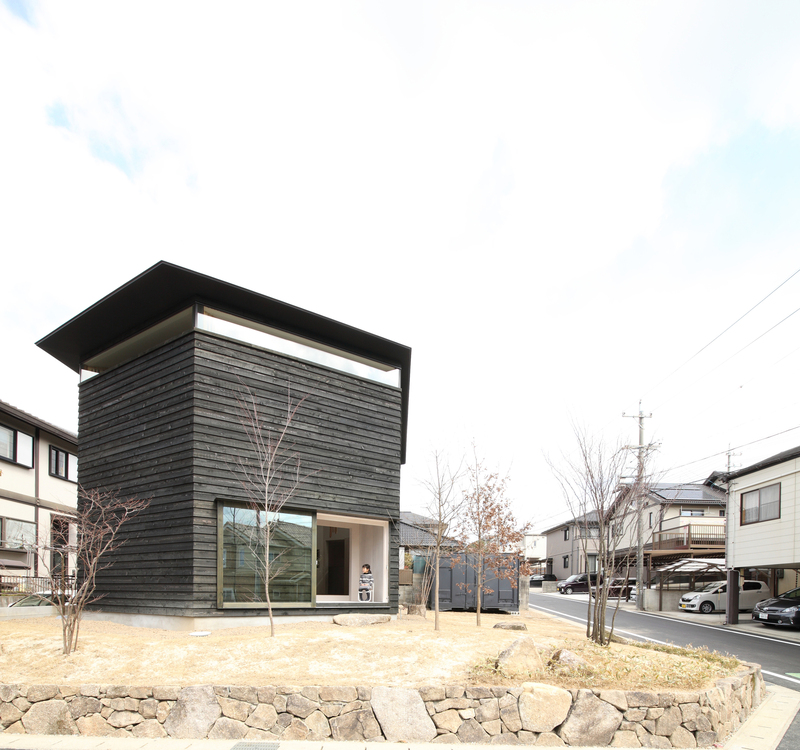 Photos courtesy of Katsutoshi Sasaki + Associates via ArchDaily. 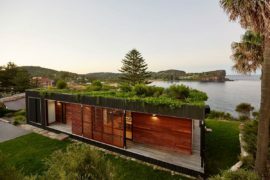 With an expansive roof that stretches towards the shoreline, the “House of the Infinite” conjures a sense of infinity, its form embracing the endless Atlantic Ocean and horizon beyond. 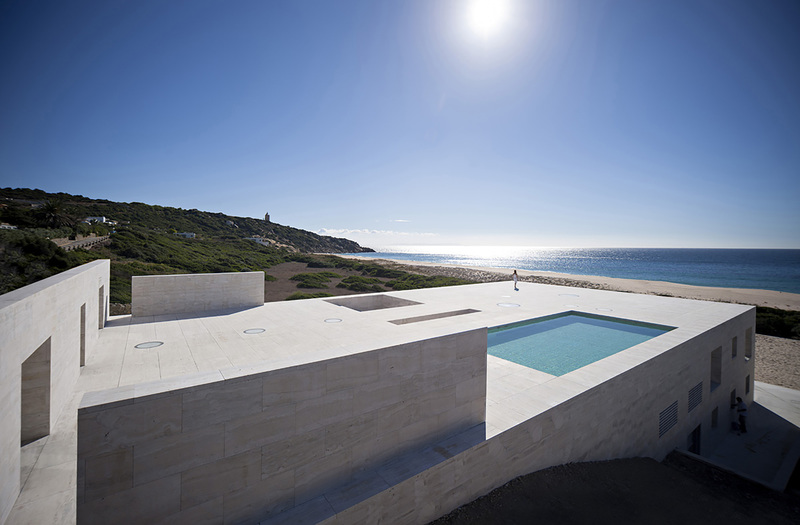 Sited in Cádiz, Spain, and designed by architect Alberto Campo Baeza, the entire structure was built using a beautiful white travertine stone that sparkles in the warm sun. 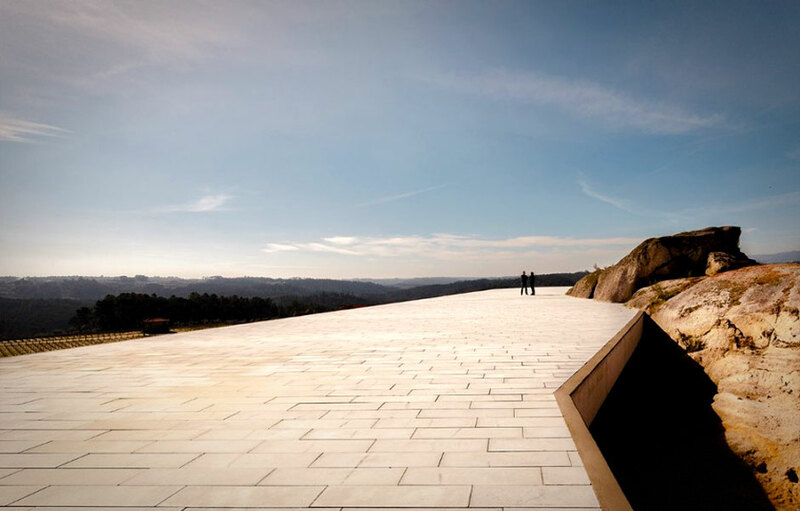 Photos © Javier Callejas Sevilla via ArchDaily. 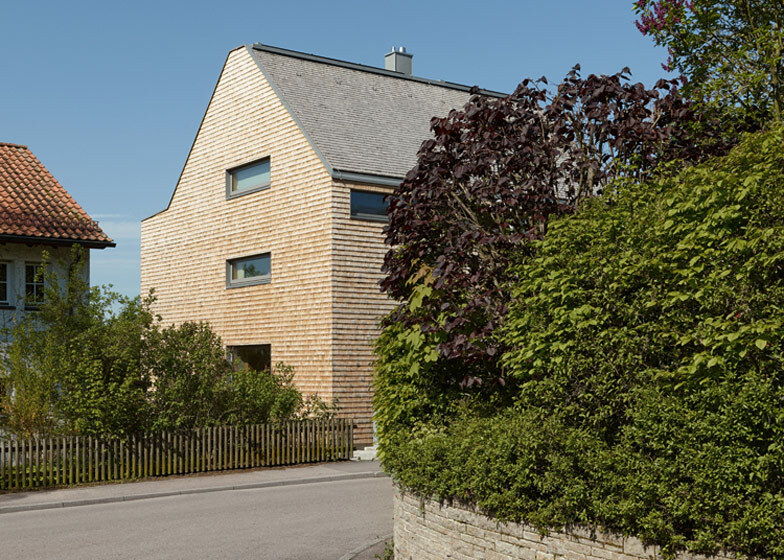 The gabled four-story Haus B19 in Stuttgart with its double pitch roof was designed by (se)arch architects. 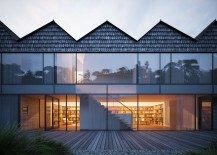 The home incorporates a gallery space for the owner’s artwork collection that rises to meet the glazed ridge of the roof. 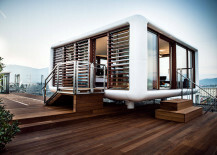 Photos by Zooey Braun via Dezeen. 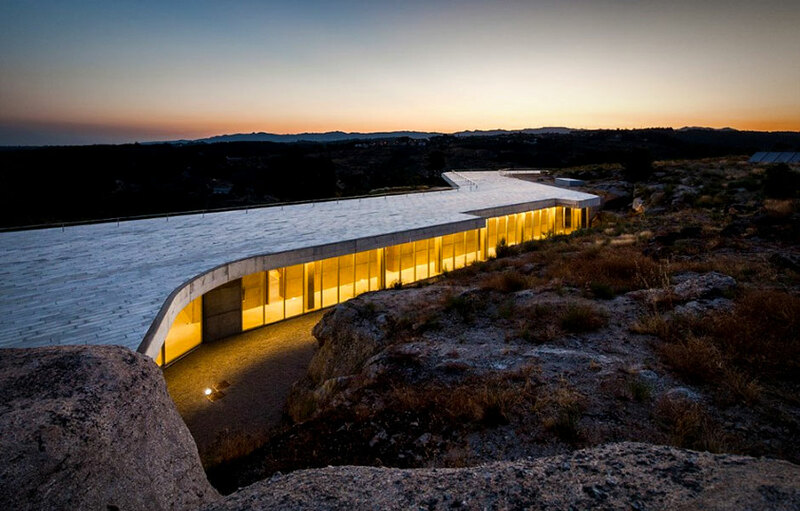 The immense concrete roof of the single-story Quinta de Lemos guesthouse, restaurant and wine showroom snakes across a sprawling Portuguese landscape. 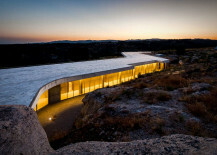 Designed by studio Carvalho Araújo, the structure is nestled amid rocky formations that helped determine its shape. 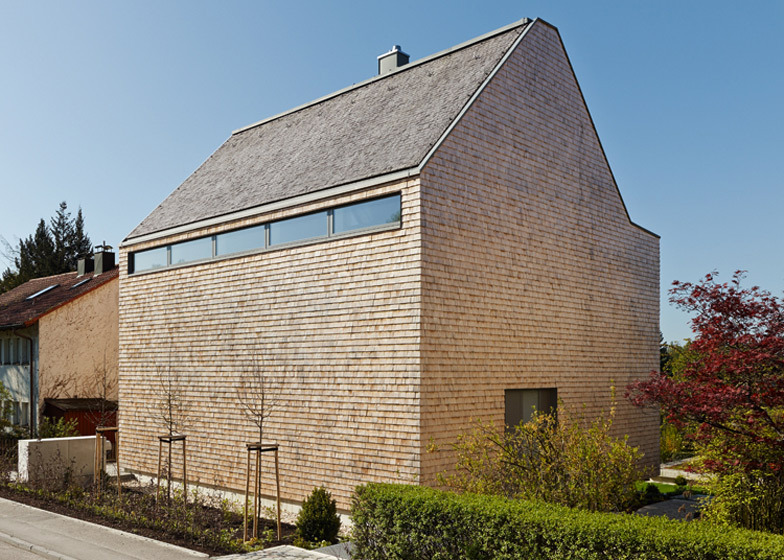 Covered with paving slabs, the roof acts as an extensive viewing platform. 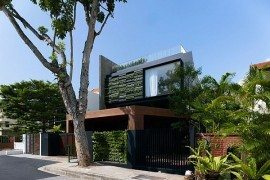 Photos by Hugo Carvalho Araújo via The Manual. 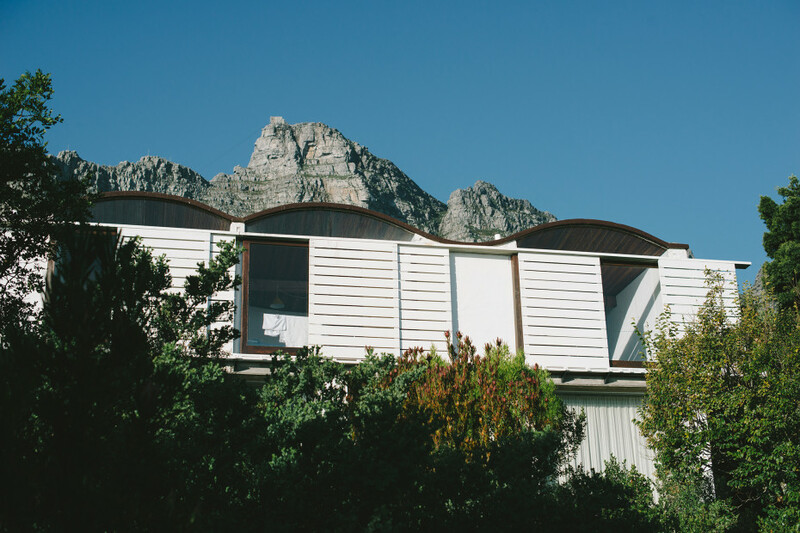 Die Es, the family home of architect Gabriel Fagan, was built in the affluent Cape Town suburb of Camps Bay. 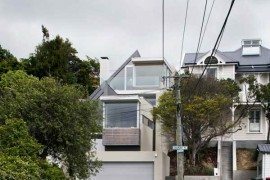 Designed by the architect, it is a blend of modernism and ‘Cape Dutch’ style. 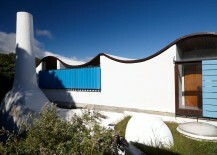 The home’s sculptural, vaulted and undulating roof is unique and is in all probability the only one of its kind. 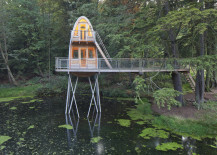 Photo by Inge Prins © Monocle. 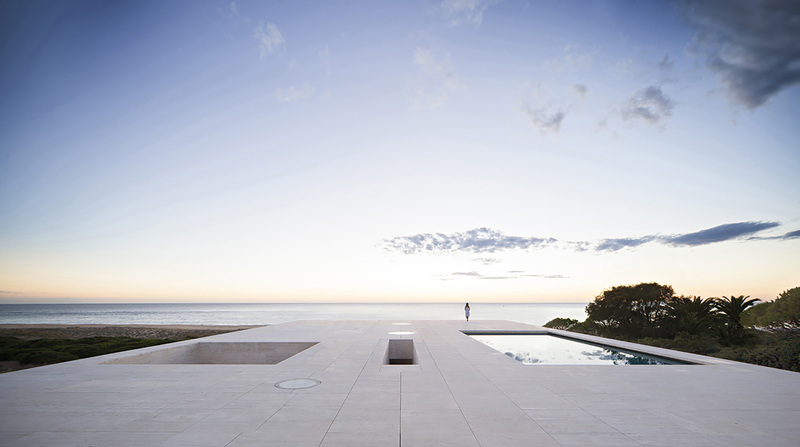 Photo by Desmond Louw & Antonia Heil via Freunde von Freunden. 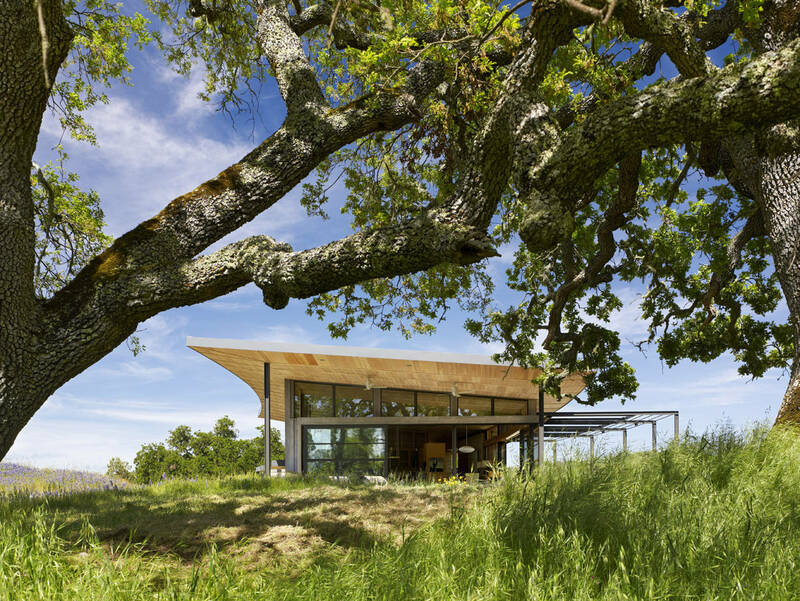 Designed by WOJR: Organization for Architecture, Hendee-Borg House in Sonoma, California features a symmetrical sawtooth roof. 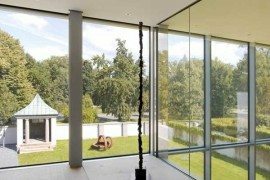 The resulting impact provides a profile that is exacting, balanced and perfectionist.